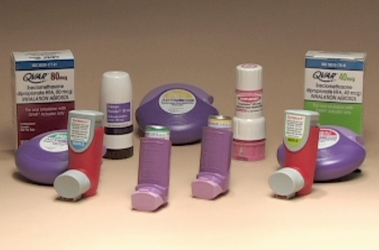 There are many different medications available to treat your asthma. But in general, asthma medications have two primary functions in your treatment. Controller medications work to help control or prevent symptoms. Quick-relief medications relieve symptoms during a flare-up. Understanding the difference will help you monitor how well your medications are working. Quick-relief medications are also called short-term, immediate or rescue medications. These medications are taken whenever you experience uncontrollable symptoms that disrupt your normal routine. Your healthcare provider will provide guidelines for using your quick-relief medications. "The quick-relief medicine I use for when I have that tightness, and I can't get air in or out. That's when I want to use my quick-acting." However, if you find you need to use them more than two times per week, you should call your healthcare provider. This is a sign that your controller medication is not working properly for you. Your overall medication plan may need to be adjusted. It's worth repeating. You need to use your controller medications every day, even when you are feeling well. If you don't take them regularly, they can't do their job. Also, make sure that you stick to the prescribed dose. "It's very important for people to take their meds properly. Do what your doctor prescribes. If he says do it twice a day, you should do it twice a day. Inhalers, if you use it more than you should - if he gives you a certain amount of times you should use it a week, if you use it more than that - get a hold of your doctor. Call your nurse. Let them know what's going on." If you feel your symptoms aren't being controlled by your medication, call your healthcare provider. There may be a different dosage or medication more appropriate for your care.